The split released on Nordvis in 2011 showed us the affinity in spirit and sometimes in form between De Arma, one of Andreas Pettersson’s notable artistic efforts (alongside Armagedda, Lönndom, Whirling and the brilliant newly born Stilla), and Fen, one of the very best atmospheric/post black metal bands around. When news on Frank Allain joining De Arma in the vest of singer-lyricist reached me, I rejoiced, predicting a stunning debut album. A beautiful adventure also has also kicked off for Trollmusic, a DIY label run with rare nobility of intent and good taste, which will become a safe refuge for all of us sincere music lovers, seekers of beauty and honesty. The most immediate impression is that Andreas has done a sterling job in composing tunes that are haunting yet simple: post rock is the staple of the album, but the Swede’s wide yet homogeneous spectrum of influences are all there so, in a wider context, we can be greeted by a cold black metal blast unleashed over a shoegazingly delicate mood, or a heart-wrenching dark folk passage can lead us to the folds of a sorrowful goth ballad. However it has been clear from the very first listen that the pivotal element of this work is the voice. Frank has outdone himself in providing the best clean singing he has so far produced: I am a long-term fan of Fen and I know how he has successfully rectified his weaknesses through relentlessly hard work, but I must admit I was surprised by the quality of his delivery. Today Frank can be proud of being a complete vocalist; his performances are unmistakable vehicles of a highly intelligent type of wrenching emotion aimed at the recuperation of human dignity. It is fair to say that Andreas, unselfishly, took the right decision in wanting the sorrowful clean singing to be high in the mix to let it became the pulsating core of this beautiful album, with the extreme vocals used as accents to highlight and accentuate moments of exacerbated distress vs. the intense flow of melancholy and yearning. Baring the soul is a tremendously hard feat, and here the perception of how an artist can turn his naked vulnerability into catharsis is overwhelming. The soul-shattering hurt and regret of a Love lost experienced and lived within a harsh and alienating urban environment provokes particularly deep wounds… This kind of pain is very familiar to me and extremely viral, so – inevitably - my listening sessions slowly morphed into regression sessions that would haunt me for days and weeks… I welcomed the challenge. The fragile side of the “De Arma sound” cascades down suddenly: swirling snowflakes impact on the gray pavement, melting into a chilly slush; the soul feels soaked through, tears ebb from eyes full of regret: the heartbreak finally releases itself. Sobbing, trembling, waiting in vain to see that loved face again… “I have nothing left to hide” Frank sings obsessively: when true love becomes impossible, it leaves you bereft of all hope; losing “the one” inexorably rips the soul apart. Time goes on and on and on, but the sorrow stays firmly like a bolder over your chest. The curse of lost love slowly morphs you into a wretched ghost roaming within the ugliest, darkest recesses of the city: the emptiness, the misery become unbearable as thousands of footsteps seem to flee away from you, alone in a faceless crowd, suddenly a stranger even to yourself. The tunnels of the underground, with their polluted warmth, became a strange place of solace. Because watching the walls of your entire being come down from your empty bedroom is a nightmare that tortures the mind and every single cell of your body. Painfully cruel are the recurring flashbacks hovering over your mind like crows over charcoaled ruins; unbearable is the sweetness of bygone happy times, once ablaze with hope. Staring empty-heartedly through the filthy, sticky film over the window panes will make your sore eyes burn: all the sorrowful silences and screams that chocked/lacerated the throats of two lovers irreparably adrift will cruelly demand for tears that your sore eyes are no longer capable to shed. As you sink deep into the mournful quick-sands of loss, the cold uneasiness of urban chaos, deceitfully, becomes your friend because it seems to mirror your soul, even though the awareness of being dislocated, body and mind, haunts you every time your steps follow a familiar route, making you physically sick. Then, one day, when even the most miniscule particle from the dark debris of your fallen world has finally settled, you will find that a sense of steadiness has suddenly enveloped you. With time, the heart has re-forged itself stronger, wiser. But not anew: the immense hole that made you feel adrift for days, weeks, months, years on end, shrunk, becoming a silent scar that wakes up whenever life will poke at it. 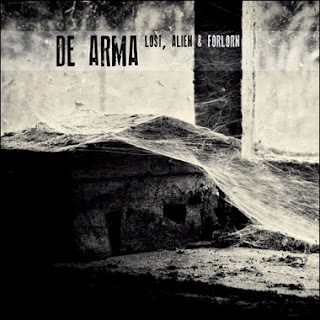 Ultimately De Arma fuses, not too dissimilarly from Alcest (in their own language and content), pure emotion and music with a sort of non-threatening immediacy which welcomes you within a well-crafted melancholy dimension. Yet beyond the fragrant flesh of the darkly melodic partitures there lies a less overt form of consciousness: as soon as you take the plunge into the harrowing tale of bravely revealed personal sorrow, De Arma becomes something else… And Allain’s own artistic approach, where nature and the environment are vivid metaphors of universal emotions, once again achieves stunning results by exposing the most poignant, tormented side of being human, with all the blind errors and regrets, ultimately cleansing both the artist and the listener’s soul.